Andy Fillmore, Member of Parliament for Halifax, visited campus Friday to announce the funding through the government’s Atlantic Canada Opportunities Agency (ACOA) Atlantic Innovation Fund. 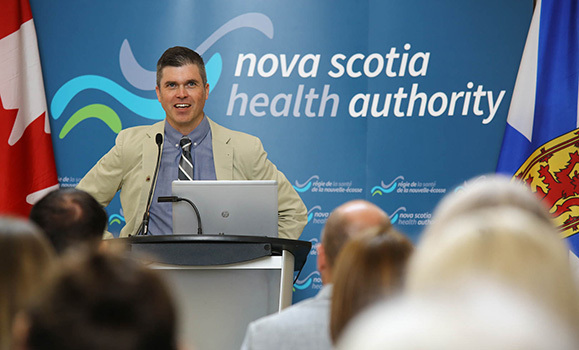 The investment marks the beginning of a new partnership between the Nova Scotia Health Authority (NSHA), where the Dal researchers are based, and Germany’s Brainlab AG — a medical technology giant that will commercialize the radiation treatment technologies in countries around the globe. Faculty of Medicine researcher James Robar, chief of Medical Physics at the Nova Scotia Health Authority (NSHA) and director of Dal’s Medical Physics program, and his team will use the funds to expand their work on developing and improving technologies that allow doctors to deploy radiation treatment in more precise, less-invasive ways that improve patient outcomes. “Although there is currently no definitive cure for cancer, it is through the work of researchers like Drs. Robar, [Christopher] Thomas, [Mike] Sattivariand and [Alasdair] Syme that we can improve the quality of treatment for people coping with cancer,” said Fillmore at the event, held in the atrium of Dal’s Life Sciences Research Institute. Drew Bethune, director of the NSHA’s Cancer Care Program and MC of Friday’s announcement, emphasized the importance of the government’s investment to the NSHA’s innovation efforts and the impact it will have on patient treatment. “Research and innovation are not only important drivers of our economy, but give hope to those afflicted with serious disease,” he said. Eight new employees, including a project manager, two medical physicists, an engineer and several PhD students, will be hired as part of the project, which will centre on developing and improving five key technologies over the next four years. Dr. Robar provided attendees with a brief overview of each technology. They range from a capacitive patient-monitoring system that provides sensitive readouts many times a second about where a patient is during treatment to an algorithm that can enable more precisely target radiation treatments that result in less damage to surrounding healthy organs and tissue. The latter technology — developed by PhD student Lee MacDonald and Drs. Robar and Thomas — is already in use in clinics around the world thanks to a licensing deal struck between Dal and Brainlab in April 2016. The ACOA funding will enable further development of the technology. Brainlab, headquartered in Munich, Germany, offers software-driven medical technology services in more than 100 countries around the world and in 75 per cent of the top 1,000 cancer treatment centres in the world. Stefan Vilsmeier, the company’s CEO and founder, called it a “fantastic day” for cancer patients worldwide. “The areas that we have identified are in some ways the missing puzzle pieces in making cancer care better,” said Vilsmeier. 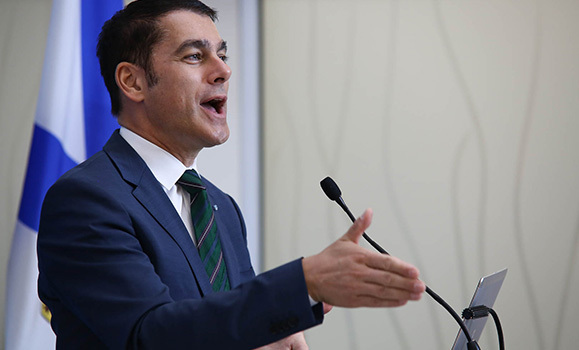 Vilsmeier said Dr. Robar and others at Dal, including Doris Grant in Dal’s Industry Liaison and Innovation office, have been integral to making the partnership such a success. “There is something that really makes this relationship with this institution really special,” he said. David Anderson, dean of Dal’s Faculty of Medicine, praised Dr. Robar and the other researchers for the important progress they’ve made in the field of cancer treatment. “The significant investment made by the Government of Canada today will serve to strengthen and build on this important research,” he said. Advancements in medical physics and radiotherapy have transformed cancer treatment and care in recent years — and through the work of Dr. Robar and his team, the most exciting advancements may be yet to come. “If this trajectory keeps going, it’ll be amazing what we are going to see in the next few years thanks to what you are doing,” said Dr. Bethune of Dr. Robar’s team.